Cape Crozier is the most easterly point of Ross Island in Antarctica. It was discovered in 1841 during James Clark Ross's expedition of 1839 to 1843 with HMS Erebus and HMS Terror, and was named after Francis Crozier, captain of HMS Terror. The extinct volcano Mount Terror, also named during the Ross expedition, rises sharply from the Cape to a height of 3,230 m (10,600 ft), and the edge of the Ross Ice Shelf (formerly known as the Barrier or Great Ice Barrier) stretches away to its east. The first landing at Cape Crozier was on 22 January 1902, during Captain Scott's Discovery Expedition. A party from RRS Discovery landed by small boat on a stony beach area a little to the west of the Cape. Scott, Edward Wilson and Charles Royds climbed the slope to a vantage point from which they could view the Barrier surface, and they were also able to observe the large Adelie penguin colony which inhabited the surrounding ice-free terrain. A message box was erected that day, prominently marked, for messages to be collected by any future relief ship. At the time it held a metal message cylinder, which has since been removed. The site has been designated a Historic Site or Monument (HSM 69), following a proposal by New Zealand, Norway and the United Kingdom to the Antarctic Treaty Consultative Meeting. Captain Scott seriously considered Cape Crozier as the base for his second Antarctic expedition. On the previous trip, the Discovery had been frozen into its McMurdo Sound berth for nearly two years, and had barely escaped in February 1904, a circumstance that had led to an expensive relief operation and some opprobrium for Scott. There would be no chance of the Terra Nova being icebound in the open seas off Cape Crozier, but the unsheltered location would make landings of stores and personnel difficult, the shore base would be at the mercy of rough weather, and the land route to the Barrier surface was problematic. Scott decided to return to McMurdo Sound for his base, though to a more northerly anchorage (Cape Evans). Wilson was keen to continue researching the emperor penguin embryo, and needed to obtain eggs at an early stage of incubation, which meant collecting them in the depth of the Antarctic winter. In the Zoology section of the Discovery Expedition's published Scientific Report he suggested a plan for a "winter journey" whereby these eggs could be retrieved. This journey, with Captain Scott's approval, was undertaken between 27 June and 2 August 1911, by Wilson, Apsley Cherry-Garrard and Henry Robertson Bowers. Cherry-Garrard later described the trek in his book, The Worst Journey in the World. In the winter darkness and extreme weather conditions the journey proved slow and hazardous, but despite mishaps three eggs were retrieved and later presented by Cherry-Garrard to the Natural History Museum. Ultimately, however, their scientific value proved minimal. The remains of a stone hut, constructed in July 1911 by Wilson’s winter journey party, have been designated a Historic Site or Monument (HSM 21), following a proposal by New Zealand to the Antarctic Treaty Consultative Meeting. Cape Crozier is within a restricted area and permission is required to visit it. Cape Crozier is home to one of the largest Adelie penguin colonies in the world (~270,000 breeding pairs as of 2012), the southernmost emperor penguin colony (~600 breeding pairs), and one of the largest south polar skua colonies in the world (~1,000 breeding pairs). It also hosts several rare species of lichens. It has been designated an Antarctic Specially Protected Area (ASPA 124). Several features on or near Cape Crozier have been charted and named by various survey and exploration groups. Bomb Peak is a peak, 805 metres (2,640 ft) high, situated 2 nautical miles (4 km) west of Cape Crozier. A ridge extends southeast from the peak, culminating in Igloo Spur, a small, isolated spur 160 metres (520 ft) high. 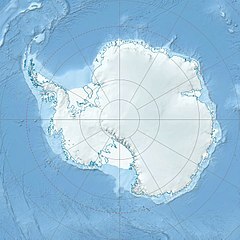 Both were mapped and named by the New Zealand Geological Survey Antarctic Expedition, 1958–59. Bomb Peak was named for the bomb-like (pyroclastic) geological formations surrounding the summit of this peak. Igloo Spur was named for the stone igloo built by Dr. E. A. Wilson and his party there during the British Antarctic Expedition, 1910–13. ^ "List of Historic Sites and Monuments approved by the ATCM (2012)" (PDF). Antarctic Treaty Secretariat. 2012. Retrieved 2014-01-05. ^ "Discover | Natural History Museum". Nhm.ac.uk. Retrieved 2015-08-26. ^ "Trends in the Breeding Population of Adelie Penguins in the Ross Sea, 1981-2012: A Coincidence of Climate and Resource Extraction Effects". PLOS One. 2014. Retrieved 2015-12-18. ^ "SCAR Bulletin". Scar.org. Retrieved 2015-08-26. ^ "Cape Crozier, Ross Island" (PDF). Management Plan for Antarctic Specially Protected Area No. 124: Measure 7, Annex. Antarctic Treaty Secretariat. 2008. Retrieved 2013-06-12. ^ "Bomb Peak". Geographic Names Information System. United States Geological Survey. Retrieved 2011-07-29. ^ "Igloo Spur". Geographic Names Information System. United States Geological Survey. Retrieved 2012-07-06. This page was last edited on 27 August 2018, at 15:00 (UTC).